Most Poisonous Snakes On Earth. This list of top most poisonous and dangerous snakes is an overview of the snakes that pose a significant health risk to humans, through snakebites or other physical trauma. The varieties of snake that most often cause serious snakebites depends on the region of the world. The Belcher’s sea snake are quite common. They are recognizable from their stripes. Usually these snakes have no interest in confrontation, but if one feels threatened, it may bite you. Three out of four times this will be no big deal, since only about one quarter of Belcher’s Sea Snakes carry venom. Those that do though have the highest concentration of venom in existence. Just a few milligrams has the capacity to kill thousands of human beings, making this the most poisonous snake in the world. Nonetheless, most Belcher’s Sea Snakes are quite harmless thanks to a docile personality and a lack of venom. fast treatment, a patient is unlikely to die, but without treatment, about 50% of bites are lethal. 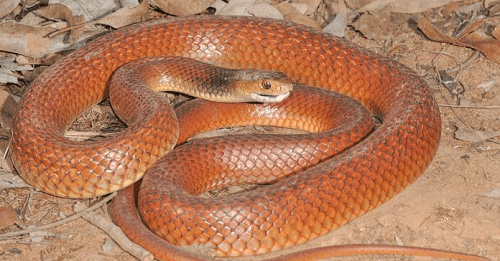 While it’s difficult to be as impressed by the Inland Taipan after learning about the concentration of venom in a Belcher’s Sea Snake bite, it’d be foolish to discount the Taipan just because its bite can only kill as many as 100 people! Taipans usually avoid human contact, however, and you are unlikely to ever encounter one. This type of snake is among the few which are actually aggressive. It is commonly found in Australia, and may be found in populated areas like cities, not just remote locations. If it perceives someone as a threat, it will actually chase that person out of its territory. If the snake is not confident of its safety, it may decide to bite. If it does so, it may bite many times during a single attack. Less than half contain venom, but those that do can cause paralysis or death. Because of its proximity to population centers and its aggression, you could argue the Eastern Brown Snake is the most dangerous snake in the world. Have you encountered one before? Let us know what you think. Drop your comments below. Some snakes are dangerous because of the speed or ferocity of their attacks, others because of how common and widespread they are, and still others because their toxins are so deadly. As you can see, though, the majority are not aggressive, and will steer clear of you if you steer clear of them. How about the Fer-de-lance? It is aggressive and it’s venom is profuse and highly toxic.